An advert from the back page of the British comic Action, issue 35, dated 9th October 1976. 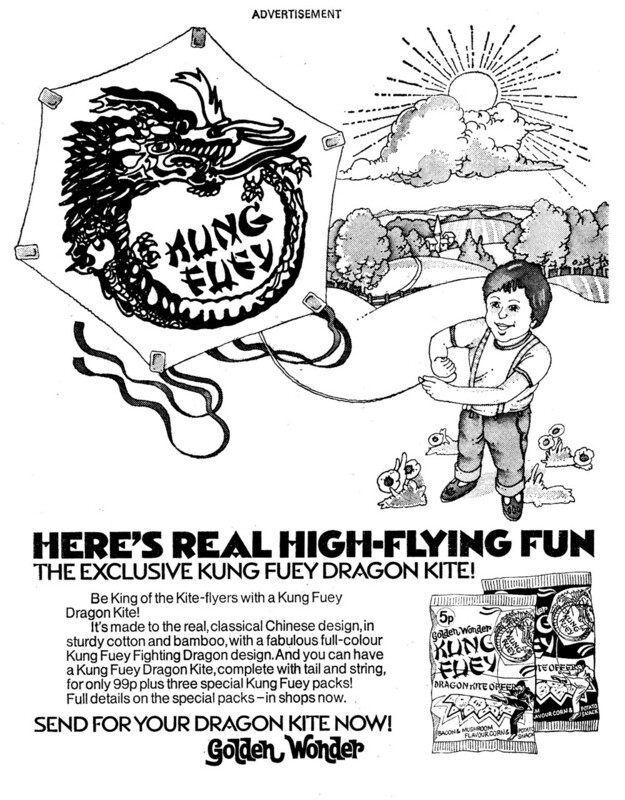 Kung Fuey snacks were, as I recall, a bit like round wotsits but with a lot more MSG. I loved both varieties, though the Cheese & Ham (in the black packet, somewhat obscured in the advert) was my favourite. I know that you can start petitions to bring back your favourite crisps, so I may consider kicking off a Kung Fuey campaign. The child in the ad looks like a suedehead in training, but he would probably need to do something about those sandals. By the way, 99p for a Kite with a Dragon on it is a bargain.